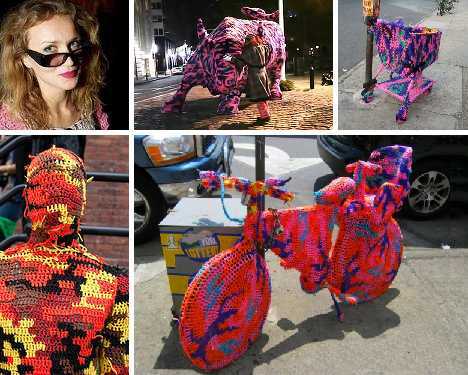 When it comes to knit graffiti, yarn bombing or urban knitting, New York City-based artist Agata Oleksiak (known as Olek) has got it all sewn up! The Polish-born queen of crochet specializes in brilliantly colored, large-scale knit-stravaganzas that add new life to an oft-drab urban landscape. Yo yo yo, mah knittas! 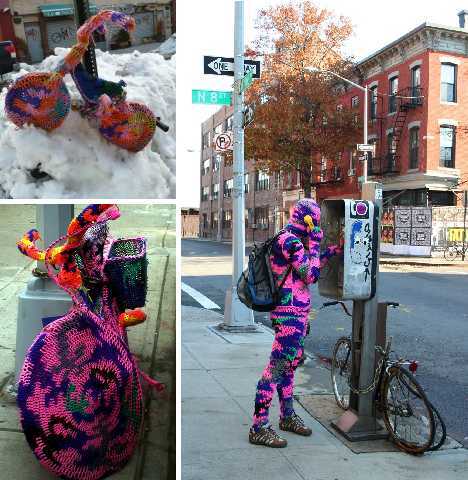 Olek is in da house… sitting quietly, knitting seriously, day after day after day. It may sound like a tedious, monotonous, stultifying existence but Agata Oleksiak (Olek, for short) begs to differ. “I can be found in my studio with a pile of movies to watch and a bottle of spiced Polish vodka, aggressively re-weaving the world as I see fit.” Knit one, pearl two, drink three, repeat! Non-Native New York Presents…… Olek! The Olek-ized bicycle above illustrates Olek’s unique style, which seems to meld CAD camouflage with 8-bit imagery. Practical? 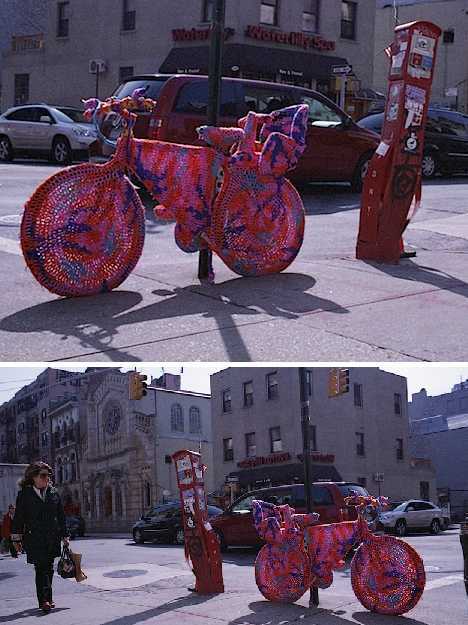 As a bike, no, but as an art object it’s practically outrageous! Born and raised in communist Poland, one imagines the now 33-year-old “yarntist” longed for bright, vivid colors to illuminate the drab confines of pre-Solidarity Silesian society. When communism fell in 1989, life suddenly presented unlimited opportunities to young Agata. Remember the scene in The Wizard of Oz when the four travelers embark upon the Yellow Brick Road as the world around them bursts into technicolor? Agata Oleksiak lived it, and her road was made from yarn. Not just the road, either. 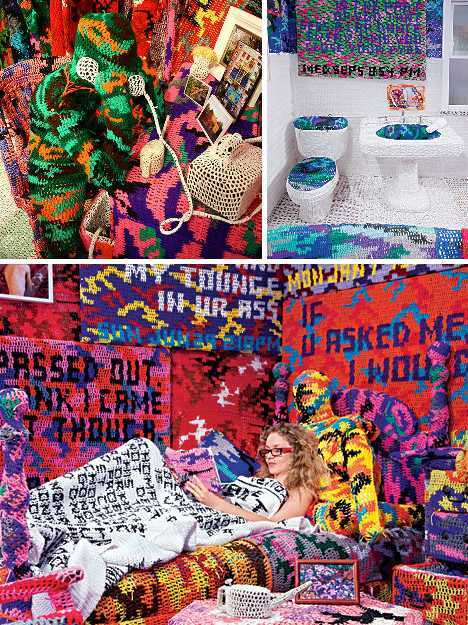 Olek aims for quality and on occasion, quantity: such as the entire apartment decked out in knitted yarn, including the residents. Hey, it beats mold plus it’s slightly more colorful. 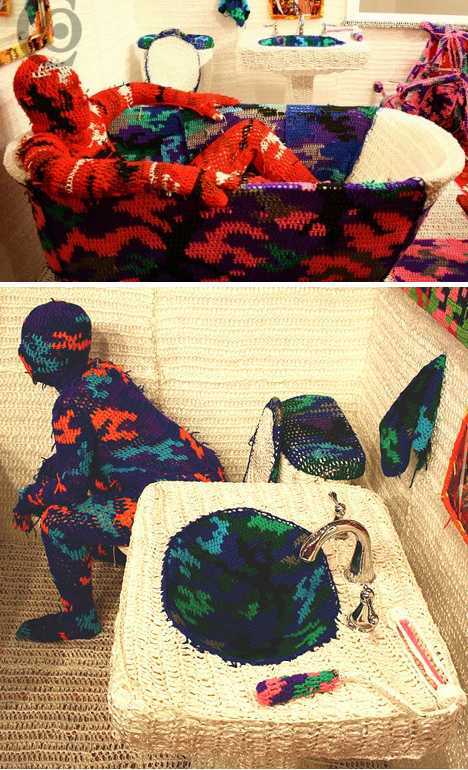 The human templates who volunteered to be a physical part of the project were presumably advised to take bathroom breaks beforehand – Olek sewed them into their knit suits without the use of buttons, zippers or fasteners of any kind. Interviewing Olek can be somewhat of an adventure, especially if you get dragooned into becoming a piece of performance art. 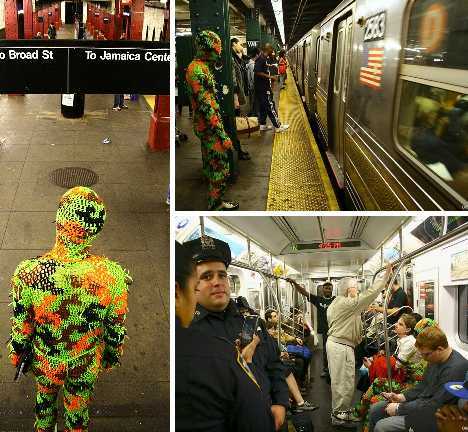 One “lucky” reporter found himself sewn into a crocheted skin, then sent out to ride the New York Subway. All things considered, it’s doubtful anyone noticed. 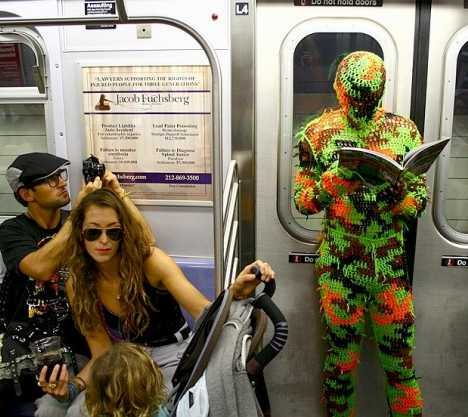 Just another day, another crazy dude on the subway… where’s Bernhard Goetz when you need him? Not satisfied with sweaters, scarfs, baby booties and the like, Olek prefers to think big… REAL big. Like cars, for instance. 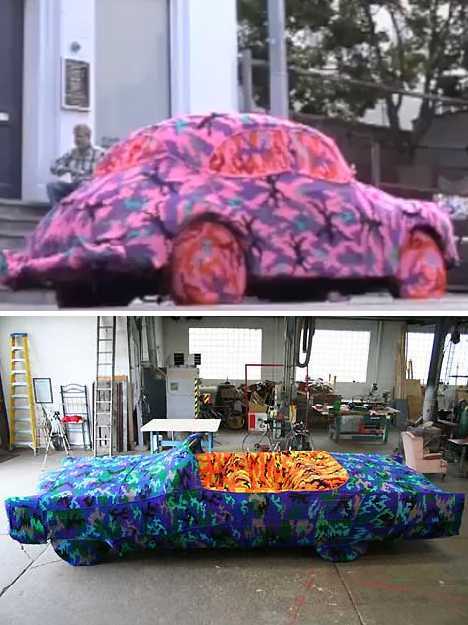 No, not gearshift covers or seatcovers, more like car covers. Such all-inclusive art has its pitfalls, however; convertible owners shouldn’t even think of raising or lowering the top. 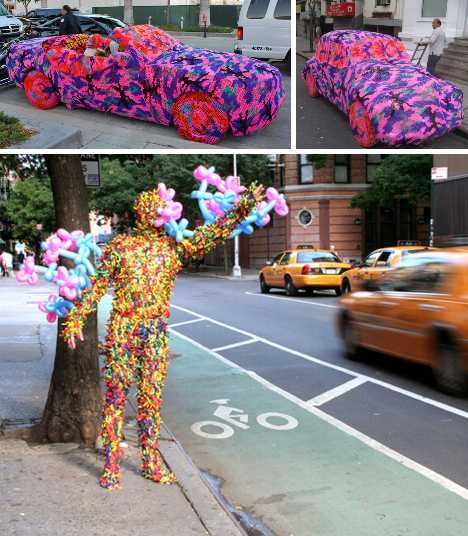 Cars are an integral part of the New York City ethos but by swathing cars in yarn and adding the essential human element, Olek changes what was animate inorganic into inanimate organic. Four wheels good, two wheels… also good! Having lived and worked in NYC for over a decade, Olex is intimately acquainted with all forms of urban transportation. 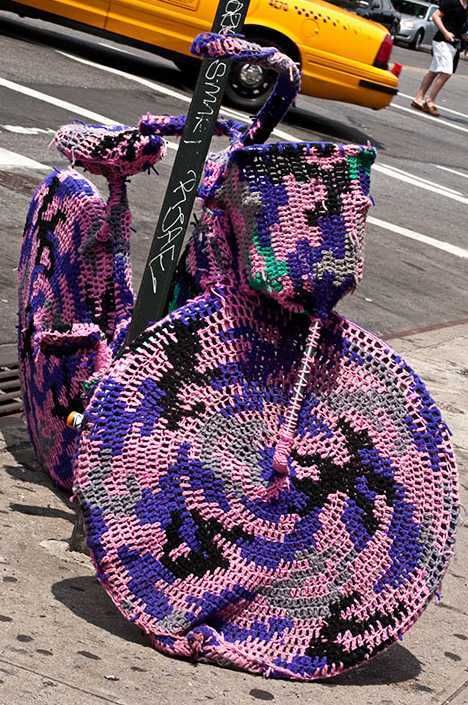 Bikes have been “needled” by Olek numerous times and the results never fail to spoke, er, spark amusement and bemusement. Street pedalers, in my New York City? Thanks to Olek, it’s more likely than you think. 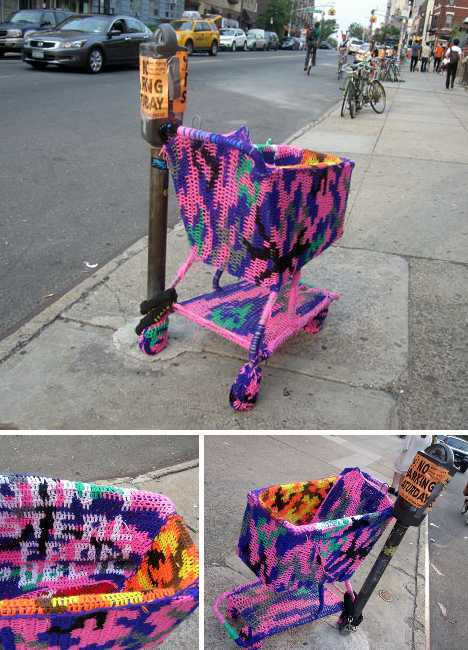 One wonders, however, how long Olek’s open-air artworks remain untouched and unmolested in the Big Apple’s urban milieu as her fame (and prices for her art) continue to rise? 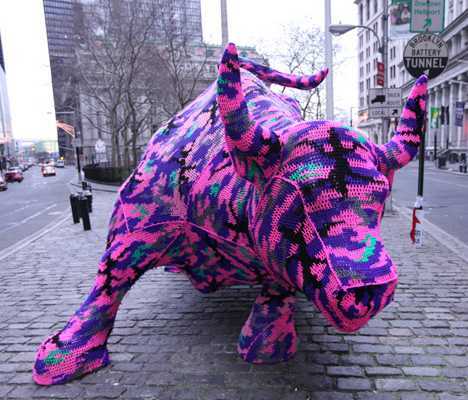 Perhaps Olek’s most notorious example of urban knitting is the Great Wall Street Coverup… no, not that one, THIS one! 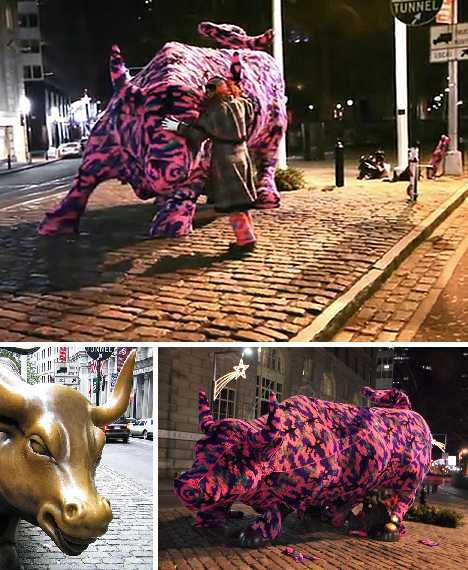 Put in place beneath a snowy December sky on Christmas Eve of 2010, Olek’s extreme makeover of Wall Street’s Charging Bull is cool enough to warm the iciest broker’s heart. The human element lurks at the heart of all Olek’s artworks, even those in which no human form appears. 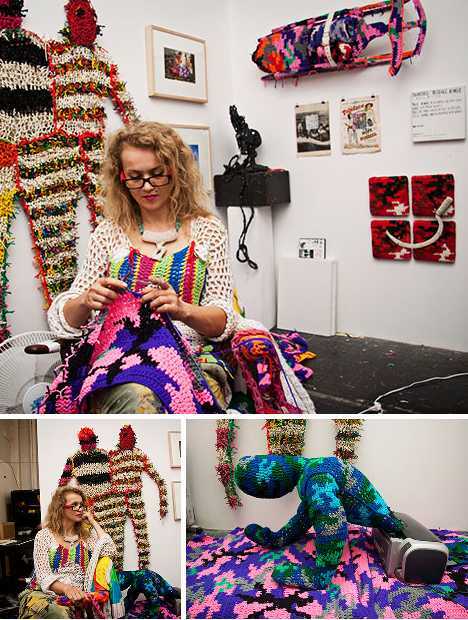 When people become part of her art, Olek hides all overt hints of their humanity but there’s no denying the life and warmth at the center. 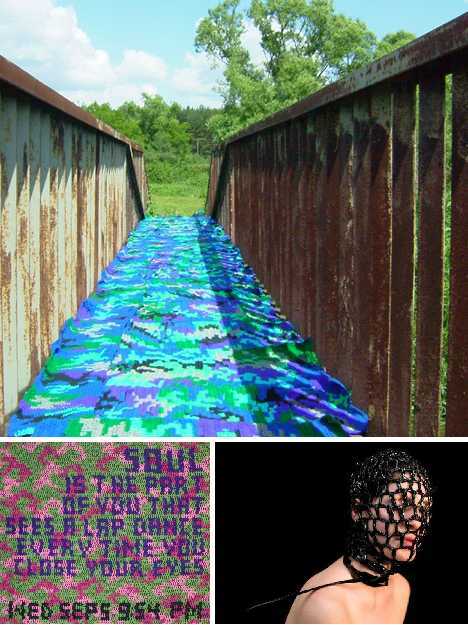 Volunteers who have undergone the “Olek treatment” find the experience almost indescribable. Feelings of constriction and claustrophobia rub shoulders in the mind with the safe and secure sense of shelter and support engendered by the all-engulfing yarn. 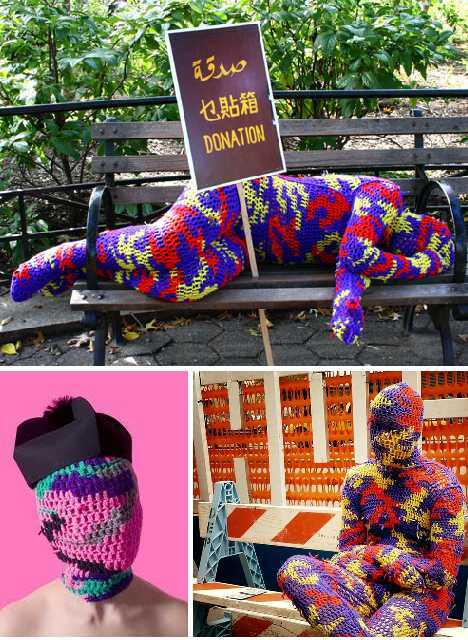 Is Olek trying to tell us something about the two-faced nature of modern society?